"Bigfoot tales are not new. Stories of a strange creature roaming the woods have been common in the folklore of Native American tribes for centuries. Some communities believe that Bigfoot (or Sasquatch, his Native American name) is part of another native tribe. Others consider it to be a shy animal that is scared of humans. Some tribes worship the creature as a guardian of the forest. For some tribes, he is a monster that attacks humans and steals children. The physical descriptions of Bigfoot creatures from differing tribes are similar. Interestingly, Indian myths from long ago describe a figure that is eerily similar to those of the most recent eyewitness accounts." Because Bigfoot has crossed into the common culture, almost everyone knows what a Bigfoot looks like--very tall with extremely big feet, hairy and apelike, and capable of human-like behaviors such as constructing shelters and throwing rocks at human intruders. Reputable witnesses report most sightings from California to British Columbia, and some photos and one film purporting to show a Sasquatch in the wild have been published widely. Investigators have even made plaster casts of his giant footprints, with some proven to be hoaxes and some not. Should hikers and campers worry? Probably not, since Bigfoot appears to be eager to avoid humans. And then there's that smell. Witnesses report that they smelled the Bigfoot well before they glimpsed him. Despite the unanimity of the descriptions and with many thousands of sightings, particularly in the rain forests of the northwest Pacific coast, skeptics ask why no specimens of such a large animal been captured? Why have no bodies, or even bones of the big guy ever been discovered? One intriguing theory is that Bigfoot is a remnant of prehistoric apes or hominids, perhaps advanced enough to live in groups and bury their dead to protect themselves from discovery or predators. Recent worldwide discoveries of fossils of homo habilus, Neanderthals, and especally Denisovans (whose DNA shows up in almost all of modern human's genotypes outside of Africa and who appear to have been larger than modern humans), have lent credence to the speculation that North America's favorite apeman could be a variant hominid which has managed to survive to modern times. Farfetched, perhaps, but the author points out that several new species of previously unknown animals have been found in the past decade. 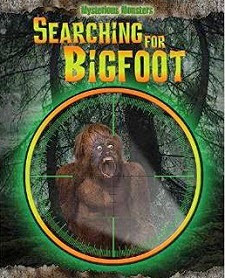 Bigfoot is our very own homegrown mystery monster, reported from Florida to Alberta to Alaska, and Jennifer Rivkin's recent Searching for Bigfoot (Mysterious Monsters) (Rosen/PowerKids Press, 2014) is a well-designed update of the lore and investigative literature. As in the other volumes in this creditable nonfiction series, realistic illustrations and actual photos keep attention focused on this intriguing mystery, while sticking to the speculative level throughout. Myth, folklore, or whatever, sightings and eyewitness accounts of this mystery monster persist, and Rivkin's balanced account also offers a curated web link that will keep young Bigfoot chasers up-to-date on the doings of Bigfoot hunters. A solid appendix for middle readers offers a glossary, bibligraphy, and index to entice young people to further reading, and accessible page design and brief paragraphis make this one a good choice to lead reluctant readers into nonfiction literature.